Was ceramic jewellery ever OUT? Frankly, yes. If you, or your mum are old enough to remember the 1980's you will remember huge jewellerific statements going on. The 90s saw the roots of reactionary minimalism get their Baby Bio droplets, so fashion became sharp, dressy and upscale. Jewellery was small, understated and expensive. If we didn't have Guru Armani's wedgy chips on our shoulders, we were nobody. Gran's trinkets were callously being swept off her shelves along with her chintz. Sounds terribly harsh and old fashioned now, in this modern era of vintage and Kath Kidson, doesn't it? Thankfully, other colours became the new black and the warmer sea breeze of Grunge began to waft over people who knew where the beach was. We had beads, we had retro bangles, we had vintage style cuff bracelets. As the millennium ship came up over the horizon, we even had the first bow wave of ethnic and Indian emblems. As the world was going to end for sure, we had to discover the Universal Energy or else (rock on Deepak!). Thankfully, we are are still around to keep investigating. Nowadays, whereas ceramic jewellery used to be thought of as being decorative whimsy, and simply not bling, we now have it as a genuine medium for expression and art - both by the designer and the wearer. For us it goes hand in hand with the whole urban art thing. Talking of urban art, we loved the feel of a London urban artist called Schneider. The name of her ceramic jewellery collection 'Porcelain Bling' says it all. 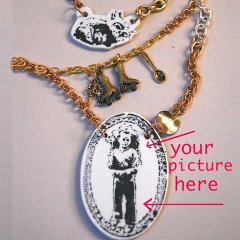 We are featuring her whole porcelain jewellery collection as we are fans, but the personalised Banksy style personalised pendant (see photo above) is the thing which first caught our eye and imagination. What we are loving is the fusing of real honest-to-goodness old fashioned porcelain with modern urban art imagery. Note the charms on the pendant - this P-bling is good. Schneider also makes porcelain tableware and sculptural pieces, so that's an area we hope to be exploring further in other sections of this site. More gentle and definitely wearing a vintage apron is actual vintage from the 60's and 70's. These designs, made by many of the big china houses such as Coalport, Adderley Florals (part of the Royal Doulton group) Royale Stratford and Royal Worcester were made using the traditional skills of their flower makers. it is now a dying art, but has been revived as part of the big move to vintage china. As with many fashions, it is how you wear it that counts. If you look good wearing lovely finds from second-hand and vintage specialist shops, these are the thing for you. 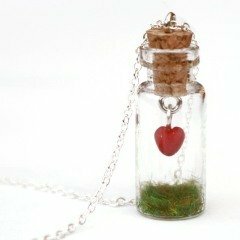 Don't wear your heart on your sleeve, put it safely in a jar, and give it to your love. So says Kim Wedlock who trades as Peaches and Pebbles (see photo above) and is also a blogger of distinction. For me the static grass at the bottom of the jar is genius. I was reading Kim's blog called 'A Blackbird's Epiphany' (www.ablackbirdsepiphany.co.uk), and she was waxing lyrically about life and the universe and deep stuff like that. I suddenly had a lightbulb moment; - 'that's what the grass is about!' - two of the most common things on planet earth (for now at least) are love, and green green grass!' - and you have it all encapsulated in a little tiny jar of fervour (just to remind you not to take it all for granted). It's like one of those wise quotations without having to say anything. So this current trend for ceramic jewellery is more of a re-awakening than anything else, as we humans were making fired beads as long as 50,000 years ago (that's cavemen, I believe). 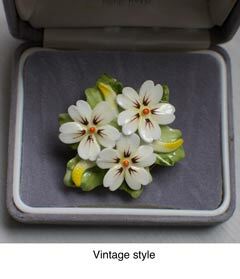 The Victorians loved their diamonds and pearls, but they also loved their ceramic jewellery too. Ceramic plaques or 'panels' were hand-painted and made into pendants and bracelets. The future of ceramic in jewellery making is very interesting and we hope to be right on top of that trend. Currently we are looking at designers working on combining some very sophisticated ceramics with gold silver and precious stones to create a new breed of jewellery. These advanced ceramics are technologically space age and feature materials such as tungsten, titanium and silicon carbide. Some people are choosing to have their wedding bands made of this scratch-proof, polished and flawless material. For us, this trend is one to watch - a true ceramic fusion, and thus, right in our zone. Who do we want to support and Why? We are into ceramic jewellery produced by artists and designers with lively minds and a strong will to make a go of their own businesses. That's where we are at. Simple. We want to support people like that and help them sell their stuff - find a market, keep their creative juices going. So our motivation is not born out of an evangelistic doctrine of 'stop the sweatshops'; it's more like saying 'Yay to the creative people in the UK making beautiful and interesting stuff - let's celebrate it!'. We have a deep vein of talent in this country, but a deep vein thromboses of not supporting it.